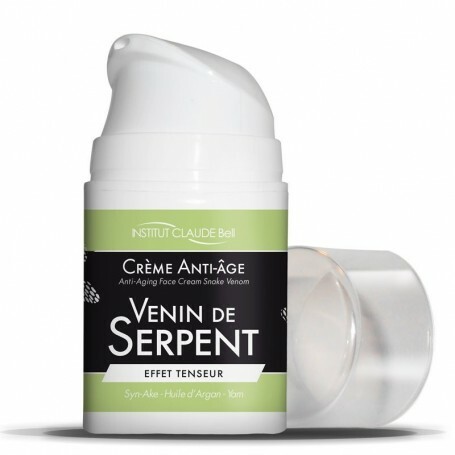 ANTI-AGING CREAM WITH SERPENT VENOUS. A COSMETIC REVOLUTION! Our snake venom anti-aging cream acts extraordinarily on the skin contributing to the reduction of wrinkles and fine lines. It brings you a lifting effect at your fingertips. Syn-Ake® active, which reproduces the effect of Waglerin 1, a component of snake venom. It allows to freeze the muscular contractions and to relax the muscles of the face. The tensing effect is fast and effective on the wrinkles of the forehead, paws of geese and other wrinkles of expressions. Argan Oil which avoids drying and physiological aging of the skin by restoring the hydrolipidic film. Yam, a tropical plant of Central American origin, rich in diosgenin recognized for stimulating the synthesis of certain hormones that play a role in skin aging. Up to 52% reduction in wrinkles after 28 days. Measurable reduction of wrinkles on 73% of volunteers. Ingredients: AQUA, DICAPRYLYL Carbonate, GLYCERIN, GLYCERIN STEARATE, CETEARYL ALCOHOL, ARGANIA, SPINOSA KERNEL OIL, HELIANTHUS ANNUUS SEED OIL, SODIUM STEAROYL Glutamate, Sodium Polyacrylate, TOCOPHERYL Acetate, XANTHAN GUM CETEARYL GLUCOSIDES, DIOSCOREA Composita ROOT EXTRACT, Carbomer, BUTYLENE GLYCOL, SODIUM LACTATE, DIPEPTIDE DIAMINOBUTYROYL BENZYLAMIDE DIACETATE, SODIUM CHLORIDE, POLYSORBATE 20, PALMITOYL PENTAPEPTIDE-4, CITRIC ACID, TETRASODIUM EDTA, PHENOXYETHANOL, CHLORPHENESIN, PERFUME.